"Carpool Kathmandu", this word has gone viral from several days on Facebook. So what is the actual meaning of Carpool! Carpool is the group of people or a driver sharing a car ride which is famous in western countries. In simple word Carpool can also be said as car sharing, ride sharing or lift sharing. How was Carpool Kathmandu established? Due to the India blockade over Nepal, we are facing a fuel crisis. Which means less public vehicles. So, there has been a problem for many peoples who have to visit different places for their works. A young energetic Nepali girl named Sumana Shrestha introduced an idea to establish a Carpool Kathmandu. So she started a Facebook group named "Carpool Kathmandu". A within weeks more than 60,000 members have already joined this group and it's still counting. What does actually "Carpool Kathmandu" do? Carpool Kathmandu is a Facebook group. This group is for those people who have a car, bike or take a taxi and willing to offer a ride and those that are willing to accept a ride. Many peoples have benefited from this group. #ASK - If you need a ride. It's simple if you need a ride, then you can search for the offers, if it matches you pick up point and destination then you can ask for a ride. Similarly, If you want to offer a ride then you can simply use #OFFER and your pickup point and destination. So, are you interested to get helped or to help other? 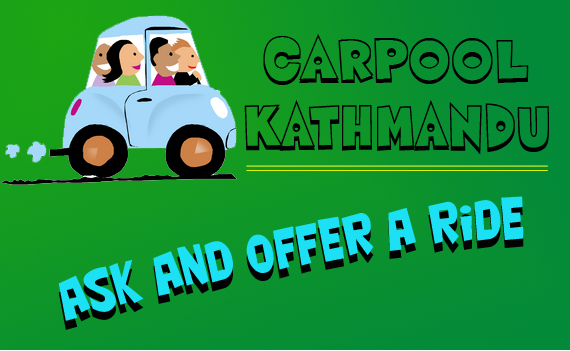 Here is the official Facebook of "Carpool Kathmandu".